Juliet is a writer living in London at the end of the second World War. She is struggling to choose a topic for her next novel when a letter arrives in the mail. It's from a man named Dawsey who lives on the island of Guernsey. He found Juliet's name in a book and has written to ask for her help in acquiring books for the Guernsey Literary and Potato Peel Pie Society to read and discuss. The two begin corresponding by letter, and soon she is also exchanging letters with several other Guernsey residents. 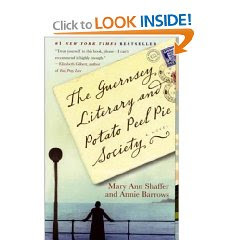 The Guernsey Literary and Potato Peel Pie Society by Mary Ann Shaffer and Annie Barrows is written as a series of letters written to and from Juliet. Through these letters, we learn about this island and how the residents on it survived the war while occupied by German forces. We hear about children being sent away from their families, people literally starving to death and friends lost. But we also read about friendship and love, and about people coming together to persevere. This is a charming book. Although some of the topics it covers are harsh and difficult, they are written about in a way that makes it easier to take in. I honestly didn't think I'd like the letter format, and it took a while to get used to it. But in short time, I hardly noticed I was reading a bunch of letters. Juliet ends up corresponding with several different people and I sometimes had a hard time keeping track of all of them. But overall, it was an easy read and an enjoyable one. I've read a few World War II books recently, and this was probably the least emotional for me. Sarah's Key by Tatiana de Rosnay and The Nazi Officer's Wife by Edith H. Beer affected me much more with respect to the war. This book is much more about the relationships of the people who lived on Guernsey during the war, rather than the war itself. It's actually a relatively lighthearted book, with a few sad parts mixed in. This review was written based on a copy of The Guernsey Literary and Potato Peel Pie Society that I purchased. I enjoyed this book when I read it last year. Glad you seemed to enjoy it as well. There was so much hype about that this book that when I finally got around to reading it, I found myself somewhat disappointed at first, but I did enjoy the story and found it to be a quick and engaging read overall.